That’s forty-five hundred—not four thousand five hundred. It’s an important distinction because 4500 is not only the name of a cab company, but also the final four digits in its phone number. In the late eighties, I had a low-paying job hacking for 4500 Taxi. It didn’t pay much, but was a great deal of fun, putting me in situations that were fodder for characters and plotlines for stories. It was a time when the economy boomed for everyone else, but for complex reasons that’d require an examination by a whole team of psychologists to unravel, the nickel and dime employment was the best I could manage. I had responsibilities and bills piling up, but pressed on and took solace with the circumstances by determining to be the best possible cabbie I could be. From dark to dark—before sunrise until after sunset—I raced around the city and hustled to make a buck or two. If truth is important—and it is—I must be forthright and say that during this period, I also engaged in a variety of income enhancement strategies of the underground economy. It was mostly legal stuff, but there were a few instances when the letter and intent of a law or two got side-stepped. Sorry if that confession disturbs or disillusions anyone. All that can be said in my defense is that a man’s got to do what a man’s got to do. Sometimes that isn’t pretty nor does it always fit between the lines. Welland was where all this occurred. It’s a city in the Niagara Region of southern Ontario, Canada. Transportation has been a vital aspect of its development. 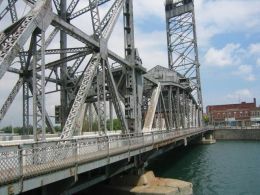 The city is known as the place where rails and water meet because along with the Welland Canal and Welland River, it’s a hub for railways from Buffalo to Toronto and southwestern Ontario. What follows are two true incidents from my incarnation as cabdriver for 4500 Taxi in Welland, which for reasons that never made much sense to me is nicknamed the Rose City. 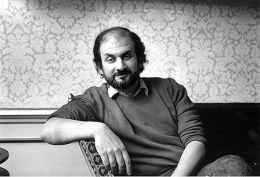 In February 1989, the British-Indian novelist Salman Rushdie was at the center of extreme controversy because of his fourth novel, The Satanic Verses. It was partly inspired by the life of Muhammad, which set off a firestorm in the worldwide Muslim community. Muslims declared the fiction blasphemous and expressed their sheer offense by going somewhat bonkers. There was a book burning demonstration in the United Kingdom, a violent riot in Pakistan, and the novel was outlawed in India. Ayatollah Ruhollah Khomeini, the Supreme Leader of Iran, issued a fatwā that called on all good Muslims to kill or assist in killing Rushdie along with his publishers. The British government put the writer under police protection—he went into hiding, exiled from the world stage. I first heard the news of the fatwā against Rushdie on the CBC World Report. It was a crisp, cold winter morning. I was driving to a call on the northside of Welland. The roads were clear patches with plenty of snow-packed spots and slices of black-ice to keep one’s attention. I was particularly wary of the conditions. A month earlier I’d had a serious accident—I’d been cut off by another car. Swerving to miss it took me on a tumbling ride as the cab skidded down an embankment and rolled over a couple times. The vehicle was a complete write-off—physically I was fine. However, the close encounter with death had me in a deep introspective funk. There was a writer inside me clamoring to be heard. At that point in my life I’d spent years in front of a typewriter hammering out words that turned into sentences to become the paragraphs of stories. There were the manuscripts of complete novels sitting on shelves in my basement bunker of an office. I had tried, tried, tried for a breakthrough, but despite heroic efforts no such publishing opportunity came my way. I wrote in a vacuum, with only a small circle of family and friends as an audience. It was this personal reality wedded to Salman Rushdie’s predicament with the Ayatollah that put a sloppy grin on my face that morning. My passenger came out of the house the moment I pulled into the driveway. He climbed into the backseat, keeping his briefcase on his lap. 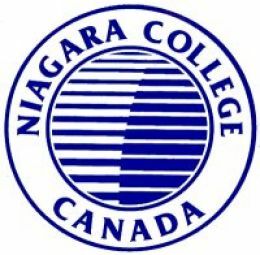 “Niagara College,” he said, carefully shutting the door. He did so with a precision that suggested the door was marked fragile, handle with care. “Okay.” I punched the meter on and backed onto the street. “I was just listening to that too,” he said, gesturing toward the radio. “Wild stuff,” I replied, turning the volume up. A commentator was attempting to explain and/or justify the outrage of Ayatollah Khomeini. “What?” my passenger shot back. His face in the rearview mirror was wrinkled into an unbelieving expression. “That’s ridiculous,” he snapped. “What do you know about it? You’re just a cabdriver.” He sat up straight and took on a rigid posture. He told me that he was a teacher and student of history, and then proceeded to lecture me about the total tonnage of what I didn’t know. I drove in silence, inwardly smiling as he droned on. I could have broken in at several junctures to engage him in an informed and intelligent dialog, but chose not to make an attempt. Instead, while his condescension threatened to push my buttons, I considered a measured response. There was a line of traffic at Niagara College. I pulled to the curb as close to the main entrance as I could get. He paid the fare to the dime, and then slid out. He took a moment to adjust his coat against the cold and tug on a pair of gloves. “Of course,” he huffed, scowling at me. He slammed the door hard. If it had been fragile, it would’ve shattered. He walked away casting disparaging looks at me over a shoulder until he entered the building. I laughed, fired up a cigarette, and drove away. “19,” Art’s crusty voice came over the crackly two-way radio, calling my cab’s number to seek my location. 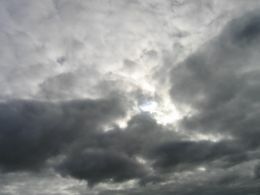 It was a brisk November day with gray clouds gathering like soldiers forming platoons to launch an attack. “King and Lincoln,” I answered, folding my USA Today. I’d been studying NFL stats in preparation for the weekly pool. “Got it,” I answered, scribbling down a couple notes. “Okay.” I placed the microphone on the hook, dropped the shifter into gear, then pulled off of Jean-Guy Boulevard. It was a wide laneway beside railroad tracks and across King Street from the Station Hotel—we’d named it in honor of a former driver who’d famously wrecked a car on it. Whatever leaves were left on trees were being torn off by a wind that whipped into gusty bursts, a herald in advance of the witch of winter waiting in the wings. I pulled up to 12 Riverside, a unique apartment building perched beside the Welland River. A long time ago, it’d been the county hospital. In fact, my oldest sister Jane Ann, along with her future husband Al, had been born there in August, 1949. A woman was standing behind glass doors. When I parked, she wrapped a scarf around her neck and came outside. She moved with slow steps. I noticed she was wearing uncomfortable looking heels. She opened the front passenger door. “Are you Tanya?” I asked. She smelled fresh and flowery, like a morning meadow in the springtime. She was a good-looking, blonde-streaked brunette in her mid-twenties, with the beginnings of crow’s-feet showing at the corners of large ovals full of a sad weariness—pretty eyes. “Where we going?” I asked, just checking. I pulled out and turned left onto Prince Charles Drive. The sun was a dull gleam near the top of the cloud laden sky. “No sweat.” I gave a little shrug. “Who’s this Billy?” I asked, having some suspicions. She didn’t flinch in telling me his last name. It was familiar to me—being a cabdriver means having access to all kinds of information that falls between the cracks. Out on the streets, the word could be weighed against sources to determine its level of reliability. “Do you know him?” she wondered, eyeing me closely. “He’s a dirt-bag,” Tanya said flatly. “Okay. If he’s there I’ll get paid,” I said, turning onto Foss Road. We were nearly ten miles down Foss Road, well outside the city limits, before I saw a tow truck stopped behind a battered old Chevy Impala. It was an isolated stretch, with farmhouses spread far apart. I parked behind the tow truck. I noticed that she didn’t make any move to get out of the car. A tall, skinny guy jumped away from the front of the truck and ran back to the taxi cab. He came to a stop beside the driver’s window, which I had rolled down. His hair was matted down and stringy, and he was wild-eyed. “Hey, Tanya, baby, look at this,” he said, yanking out a roll of bills from the pouch pocket of a tattered old hooded jacket. The top one showing was a fifty—if the rest matched, then he was holding a grand or more. He bent in close, thrusting his face toward Tanya. He was juiced up on cocaine or something—his eyes were spinning first clockwise, then counter clockwise. He was antsy and jittery, like maybe there were tiny midgets juggling knives inside his head. All of a sudden he noticed me, seemingly for the first time. “What’s wrong with your car?” I asked, taking in as many details as I could. “Where’d you get that money, Billy?” she asked, but he was already out of earshot. He was dickering with the tow truck driver. After a minute or two, he pealed three bills from his roll and handed them over. “You don’t have to go,” I said, staring at her. The tow truck pulled away and headed down the road. 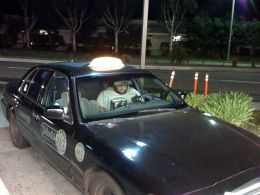 Billy came back to the cab and tossed me a fifty. He stuck his head in the window. “Let’s go, baby. We’re gonna have us a good time.” He was flying high. He didn’t wait for her, but skip-walked to the Impala, hopping behind the wheel. “You got paid,” Tanya said, forcing a tense smile. “No. I’m going with him.” She opened the door and started to climb out, but I stopped her by placing a hand on her shoulder. “Wait a second, Tanya.” She sat back. I reached over with my left hand and turned her chin so I had her directly in my sights. I studied the lines of her face and then stared straight into those dark ovals that were pretty and vulnerable, but tinted by hardness. It was a long, stretched out while that was punctuated by the Chevy Impala’s honking horn. “What are you doing?” she asked, frowning. Her frame went rigid, her face abruptly got ugly, and those eyes flared angrily. “Screw you! You got your frigging money!” She slipped out of the cab and wobbled on the high heels. Just before she dropped into Billy’s car, she flipped me the universal one finger salute. I tipped an imaginary hat, then wrote down the Chevy’s license plate as it belched black exhaust and sped away. I maneuvered a three-point turn, reporting to Art that I was clear, which elicited a muttered grunt in response. I put the word out along the grapevine. Any news about Billy I wanted to know. For the next week or so I kept a vigil with local radio and papers to see if there was any coverage that’d connect to Tanya. I truly worried that she’d be found dumped in a ditch somewhere. Thankfully, as far as I know, that wasn’t her destiny. Driving cab is often looked down upon. I’ve noticed that seemingly polite and respectable folks have no trouble taking potshots or making snide remarks about cabbies. Not sure exactly why that is—oh, that’s not true. The reason is really quite simple; denigrating others is the full flower of human nature. We all have a need to be or feel superior to someone. Our tribal instincts are never very far from the surface of our attitudes. We make wholesale categorizations of people, as though every group has a character that is an etched in stone definition based on cliché or worse, stereotype. Feel free to deny any or all of that, but listen closely to how easily we drift into segregating people based upon the job they do or their economic status. Our capacity in this area is really quite sickening. My experiences as a cabdriver—of which there are many more stories to be told—taught me beyond doubt that people are people. From all across the strata of society, there is a common theme to our lives. Two lessons: (1) Every individual is much more than the substance of his or her appearance. (2) For the want or love of money, some people will always be willing to do anything. Timeless truth witnessed as life rushed past a cabbie’s windshield.